Revive your skin without the risk of irritation with this gentle version of NYC dermatologist Dr Dennis Gross' at-home peel. No matter how sensitive your complexion is, you need to exfoliate and nourish to improve the effects of the rest of your skincare routine, for radiant skin. 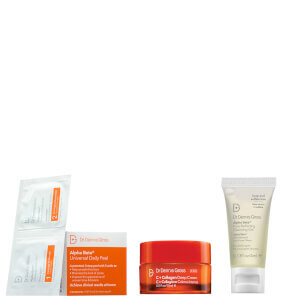 Step 1 is packed with rejuvenating powerful yet gentle exfoliating acids. Step 2 controls the alpha hydroxy acid activity and delivers anti-aging actives, nourishing and soothing skin, keeping it balanced, soft, and luminous. The addition of calming, hydrating ingredients including colloidal oatmeal comfort and protect delicate skin. Daily use produces powerful results - reduced fine lines and wrinkles, minimized appearance of pores, and enhanced radiance - with a soft touch. This gentle formula contains a combination of three acids, ideal for sensitive and fragile skin types. Ideal for sensitive and fragile skin types. Once a day, massage step 1 pad on to clean, dry skin until pad feels dry. Wait two minutes then follow with step 2 pad. Do not rinse after either step or apply products containing alcohol. Make sure to use sunscreen daily to help prevent photo-aging. step 1: Water/Aqua/Eau, Hamamelis Virginiana (Witch Hazel) Water, Lactic Acid, Mandelic Acid, Salix Alba (Willow) Bark Extract, Cucumis Sativus (Cucumber) Fruit Extract, Camellia Sinensis Leaf Extract, Achillea Millefolium Extract, Anthemis Nobilis Flower Extract, Cocos Nucifera (Coconut) Oil, Rose Extract, Soy Isoflavones, Rosmarinus Officinalis (Rosemary) Leaf Extract, Citrus Aurantium Bergamia (Bergamot) Fruit Extract, Citrus Limon (Lemon) Fruit Extract, Prunus Persica (Peach) Fruit Extract, Aniba Rosaeodora (Rosewood) Wood Extract, Jasminum Officinale (Jasmine) Flower Extract, Coriandrum Sativum (Coriander) Seed Extract, Cupressus Sempervirens Seed Extract, Fucus Vesiculosus Extract, Vanilla Planifolia Fruit Extract, Copper PCA, Zinc PCA, Lavandula Angustifolia (Lavender) Extract, Caprylic/Capric Triglyceride, Polysorbate 20, Alcohol Denat., Disodium EDTA, Potassium Hydroxide, Phenoxyethanol, Sodium Benzoate Ingredients step 2: Water/Aqua/Eau, Caprylic/Capric Triglyceride, Polysorbate 20, Sodium Hyaluronate, Colloidal Oatmeal, Camellia Sinensis Leaf Extract, Centella Asiatica Extract, Retinyl Palmitate, Tocopheryl Acetate, Ascorbyl Palmitate, Soy Isoflavones, Phospholipids, Resveratrol, Ubiquinone, Achillea Millefolium Extract, Raphanus Sativus (Radish) Root Extract, Copper PCA, Sodium PCA, Zinc PCA, Lecithin, Octoxynol-9, Simethicone, Tetrasodium EDTA, Polysorbate 80, Sodium Bicarbonate, Phenoxyethanol, Sodium Benzoate. I've used this product for the last year and love how it makes my skin look and feel... smooth, clear and bright! It's easy to use after evening cleansing. I use 2-3 times a week, rather than daily. Also, each pad is used twice; once each side. Always have it on hand. I have oily skin but in the winter it gets dry and loses its radiance. I also have blackheads, etc. this product brightened my skin like nothing else. It also left my skin super smooth to the touch. I bought the five day supply and cut each pad in half so I was able to get 10 uses out of it!